During yesterday’s keynote Apple presented new iPods that got all Apple fans excited, including us. New versions of Shuffle, Nano and Classic and the totally new iPod Touch which is basically the iPhone without the phone part. 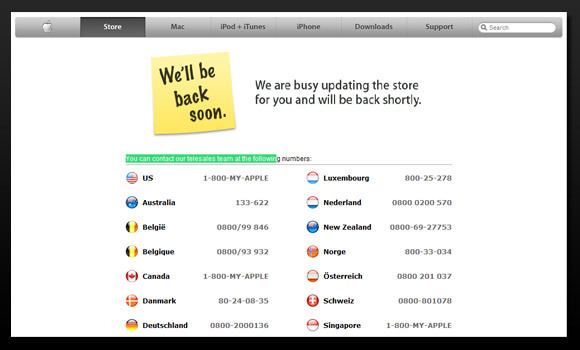 As always when Apple introduces new products they take down their online Apple Store while they do the updates. All that we who want to see or order the new hardware can do is wait and eagerly push reload. But hold on. Why keep pushing reload? With Mr Uptime we could just add a watch on the temporary “We’ll be back soon” page and as soon as Apple Store was back up, we were told of it and the website loaded automatically in a Firefox tab. To do this we simply added a watch to check if the contact text on the web page above had been removed. It’s as simple as selecting the text that should not be present on the page and then choose “Text string should not exist on page” in the Mr Uptime menu when you right click the page.